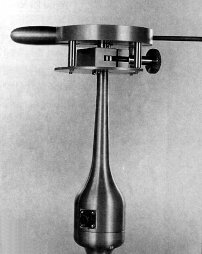 The 200-1249-A Wind Direction Calibrator is a mechanical device used to calibrate systems which include Micro Response or Low Threshold Wind Vanes (200-2020 or 200-2005). The 200-1249-A Wind Direction Calibrator is a mechanical device used to calibrate systems which include Micro Response or Low Threshold Wind Vanes (200-2020 or 200-2005). It mounts directly on the vane and has three possible uses. First, it can be used to position the vane at four points, exactly 90° apart, to check the readings of output devices. Second, it can be used in sigma system calibration to give a direction change of exactly 90°. And third, it can be used to hold the vane tail in place during orientation to north.